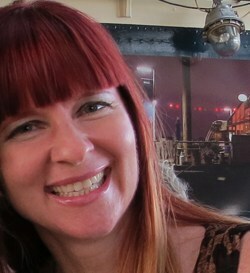 I may be known for my eccentric, over-the-top style most days but there are some days when I like to keep it simple. This is one of those occasions. This outfit is 100% retail. Not a fact I’m bragging about by any means. I prefer thrifted or vintage items but I’m not bound to them. When a piece such as this floral blouse catches my eye, sometimes I give in to the retail consumption monster and buy it. The handbag, shoes, and jeans are all very old and bought at TJ Maxx which used to be one of my favourite shopping destinations before I discovered the joy of thrift shopping. Here is a funny video, an ode to my joy of thrift shopping made possible through the talented Melanie from Bag and a Beret and Sue from a Colourful Canvas. We had such a blast making this video loosely based on my 20 Top Secret Pro Thrift Shopping Tips. My favourite bits are when I came out of the dressing room wearing what I thought was a great find, and Sue’s honest reaction and also the surprises I found in the pockets of a coat. Thrifting is always such an adventure! White jeans were previously a no-go item for me. Normally white and I do not get along as it washes me out. White on my lower half however, is just fine. For years I thought white added weight to my bottom half. Not something I need help with. I’ve got that taken care of thank-you-very-much. Especially since I’m not from the generation where big bottoms are fashionable. Funny how times change. As with everything fit is key, and these ones fit me well. I think they are meant to be cropped jeans, on people with longer legs than I. No worries though, I simply turned up the cuff once. Let’s all thank Joseph Shivers who invented lycra. Thanks to you my jeans are super comfy. I did in fact, do a cartwheel in this outfit, they are so comfortable. I had to edit out the top part as I’d forgotten that the top wasn’t tucked and I flashed much more skin than a family friendly blog should. Brogues are one of my favourite shoes to wear when my plantar fasciitis isn’t flaring up. Alway a sucker for a pretty pattern they are usually what catches my eye first when shopping, possibly due to the fact that I used to design patterns for a living. For a gal that never liked white jeans before I’m surprised how often I’ve managed to wear them. I think it is directly related to the fact that they are so comfortable. What about you? 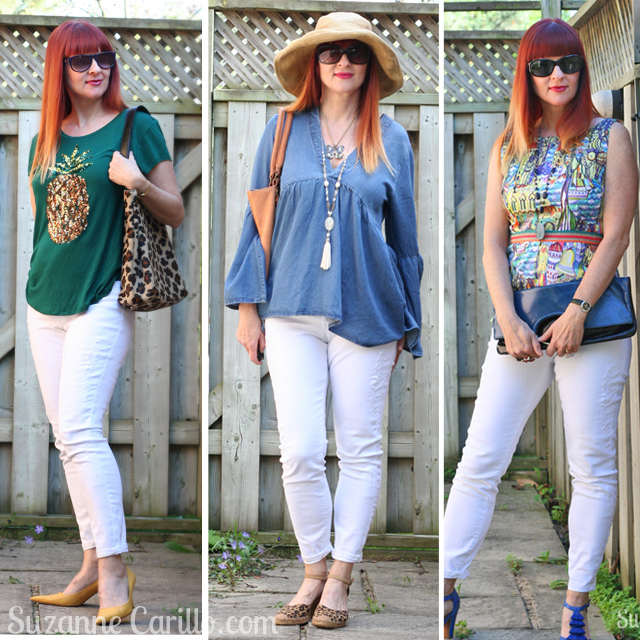 Are you a fan of white jeans in summer? You look fabulous in the white jeans! 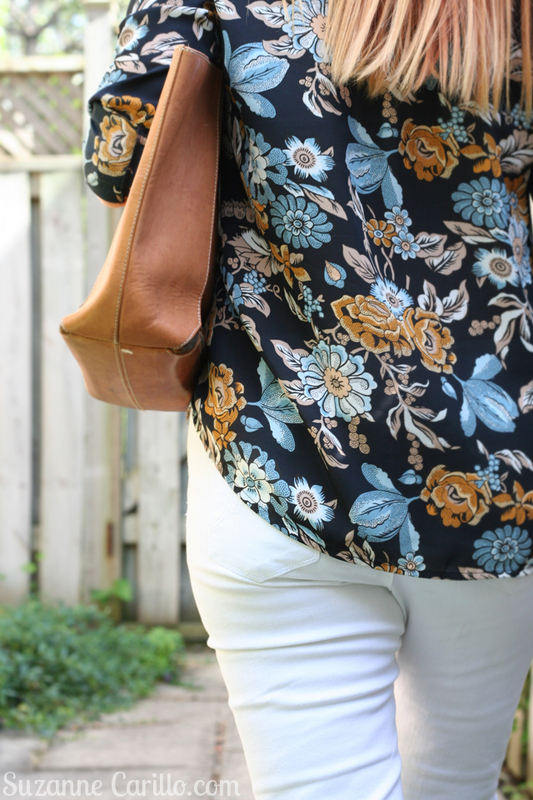 The floral top is so pretty, and I like all the ways you styled the jeans! So happy you liked the video. I have a hard time keeping a straight face…you may have noticed! But it was so much fun making this. We had so many ideas for this bit. Shame you weren’t there to participate. 🙂 Your hair matches your blouse, your bag and your shoes. Wow! I don’t think I’ve ever worn white jeans before in my life. That video was a riot! So glad you liked it! We had so much fun doing it. You look great in all your stylings of white jeans. It’s funny how styles grow on you – I too have fallen not for white jeans but white chinos, almost the same. And I have consorted with the retail monster on occasion as well. As for the video, I love all the ideas you came up with. It was so much fun filming with you and Sue. I’m glad the store didn’t kick us out! Heh. I think they thought you were a star! But of course…! I know! We were very lucky no one got mad we were filming. I loved that video especially the checking the pockets bit, blinking hilarious. I can’t believe that your charity shops are the size of supermarkets and that you need a trolley to wheel around your finds…crazy! Yes, in North America we like to do things BIG. Well, a few thrift store chains are really big and this is one of them. Ha! I didn’t know this was a “family-friendly blog.” I thought it was a Fascinating Exploration Of Life Through Creative Choices In Fashion blog. Ha ha! What a great tagline! I may have to steal that! I’m surprised you don’t own some white jeans already. Your long legs look so great in jeans. I love the video of course and just wish I could join you girls some time for a big shopping spree. Looks like the best fun ever. I’m with you on that avoiding white thing – I’ve been doing it for years. This year, though I did pick up quite a few white clothes while I was thrifting but have yet to wear them – and heck, summer is nearly over. 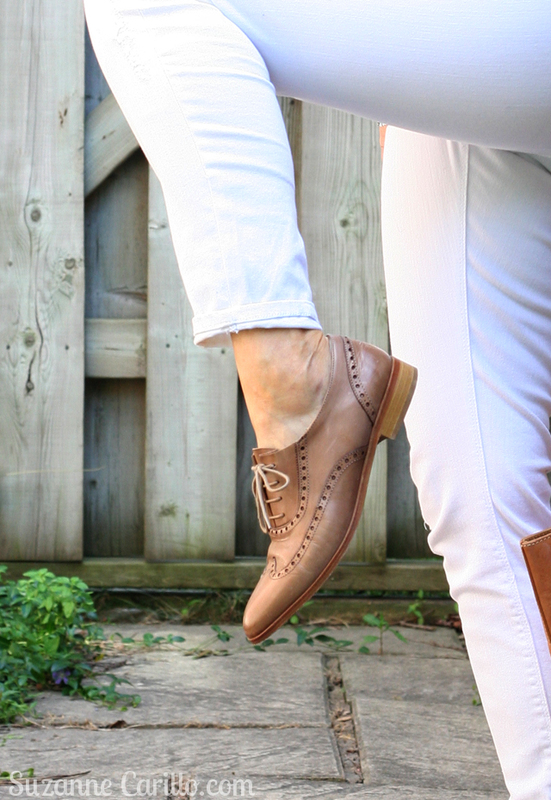 The white jeans and brogues idea is one I think I could employ successfully, so watch out for that on the blog soon. I fear you and I will never be able to thrift shop together Anna. Our tastes are too similar and I’m worried with your strong swimmer’s body you’d take me down. The video has changed my life – the best I’ve seen. It shall improve my thrift shopping no end! Especially loved the mini christmas tree from the so called pockets! I really like this look on you. Simple, effortless, perfect for Summer. I too avoided white jeans but not because of a big bum – but practicality. In London as soon as you sit on a train you’re white jeans are no longer pristine! That Christmas tree was Mel’s idea. I wasn’t sure it’d fit in the pockets…but damn…they were HUGE! Ha ha! I’m a huge fan of summer wear fashion and therefore keep waiting to come summer season. 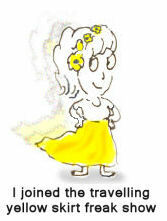 I prefer to wear a comfy and fancy dress for summer season. It requires a perfect sunglasses and trendy shoes to look fashionable in front of people. Wearing a simple and good looking dresses may also leave an impression among people who always like to see people in different look. I agree with your tip top thrift shopping tips, it’s really great beneficial in human life. because of people love to wear an expensive fashion wear but due to lack of money they prefer to shop from thrift store where it requires lots of tip to purchase a good outfits and things from thrift store. You are looking so stylish with this simple but impressive white jeans, bag and perfect pair of shoes too. The dress is well fitted on you and great matching with your awesome goggles and colorful hairstyle. I love white jeans. Always worn them. My problem however, is that I am very small in the hip area. Which makes the jeans look too wide. Even with lycra. Or if they do fit, they cut my legs too much and make sausages of them. It is a fine line how tight they can be. And I haven’t found the right ones yet. Certainly not a summer (breezy) pair. Which is a crying shame. Yours look perfect. And indeed I cannot understand how you did without them for so long. I love all your outfits with them. PS the video is so well done. Really enjoyed it. Oops .. and yes of course the shirt is great too. Like you I am a sucker for great patterns. I am still swooning over that sleeveless peplum top (top right picture of the six). Hahaha, that video is hilarious! I plan to see Absolutely Fabulous, the Movie, soon. I just hope it won’t be a big disappointment after watching The Three Thrifters Fabulous;-). Honestly it will be hard to watch any movie now! Hahahahahaha! Second…I’m glad you found the love of white jeans!! I know this sounds extreme, but I just can’t imagine life without them! And you look positively hot in yours! Third—Love the brogues—I have to admit I thought I’d never be one to wear them. And we know how that ends up–ha ha—i have 2 pair now! Melanie chose that music. It was perfect. First off, you can still do cartwheels??? WAY TO GO! Second, the video . . . well you three are the best! I can’t tell you how many times I’ve watched it but even Par is showing you off, and laughing his head off. Well done ladies. And lastly, thanks for reminding me how wonderful white jeans can be, mine seem to get hidden in the closet during the hot hot summer months but I’m thinking its time to bring them out. 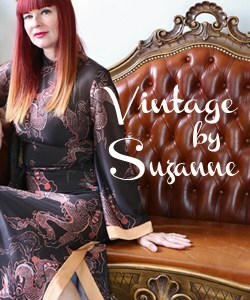 Suzanne inspiration at its best! I’m glad you and Par enjoyed the video. We had such a blast making it. Melanie is a genius with editing and Sue was game for anything. 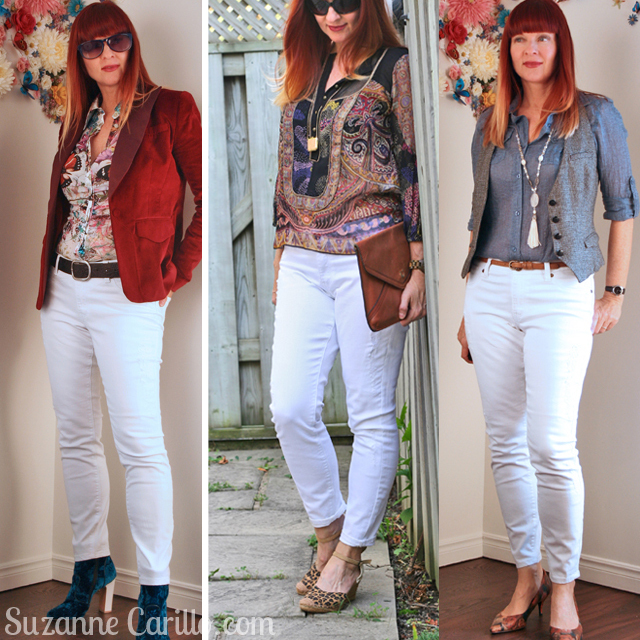 I love white jeans and I think I was the same as you with avoiding them in the past. They are now a summer staple of mine. I love all of your looks and the fabulous video! 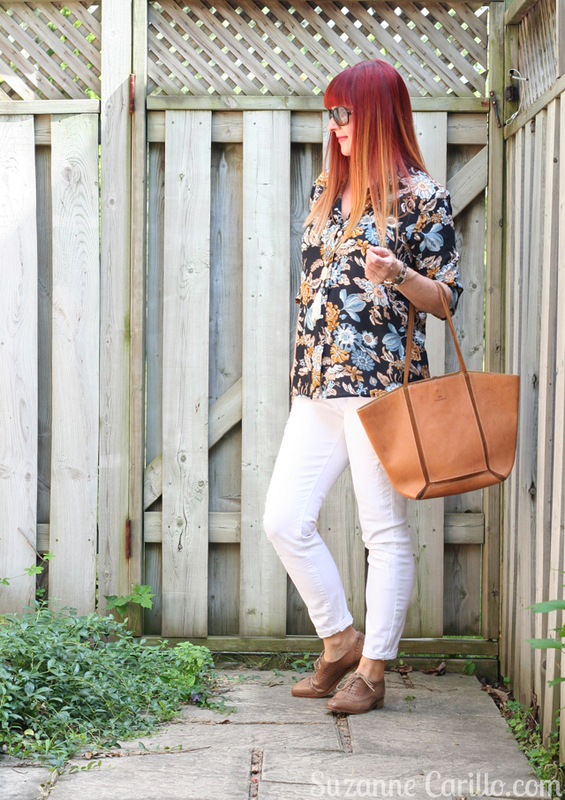 Love the white jeans, and pretty shirt, ( love it!) , loved the brogues, too another favorite!